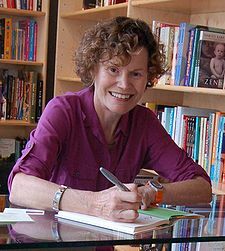 As Judy Blume walked onto the stage at Seattle’s Town Hall on June 11, the 900 people in the audience rose to their feet. 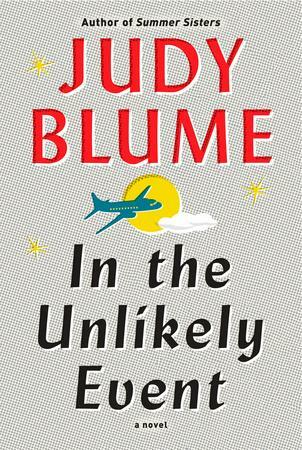 I was among the sea of women (with a few men in our midst) clutching a copy of Blume’s latest novel, In the Unlikely Event, as I applauded. Of the many Seattle Arts and Lectures (SAL) events I’ve attended, this was the first time I’d seen a standing ovation for an author before she’d spoken a single word. The 77-year-old writer has an impressive résumé: author of more than two dozen books for children, middle-grade readers, and adults; her books have been translated into 32 languages with more than 85 million copies sold; she was named a Distinguished Alumna of New York University and the recipient of numerous awards, including the Library of Congress Living Legends Award. Her 1970 young adult novel, Are You There, God? It’s Me, Margaret,” may be her best-known book. According to the SAL brochure at the reading, this book was “praised for its warm and funny descriptions of childhood feelings and conversation,” at the same time that Blume was criticized “…for its references to the human body and its processes.” After its publication, she earned “the rather dubious distinction of being one of the most frequently challenged authors of the 21st Century.” Now her work is viewed as groundbreaking, and Are You There, God? It’s Me, Margaret is on Time’s list of 100 best English language novels written since 1923. And I hadn’t read a single one of Blume’s books. I’m just old enough that her books for teens didn’t come out until I was graduating from high school. By the time my own children were adolescents, Blume’s young adult books weren’t as prominent as they’d been two decades earlier. But, my (younger) writing friend and fellow alum of Northwest Institute of Literary Arts, Janet Buttenwieser, has read (and loved) Judy Blume’s work, and when I asked Janet if she wanted to go to the lecture with me, her “yes” was instantaneous—and enthusiastic. I’ve attended a number of SAL’s lectures, and all of them, such as the one by Rebecca Solnit (see Afterthought #29), have been thought-provoking, informative, and entertaining. Judy Blume’s appearance was no exception. 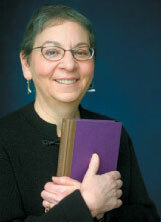 Once the standing ovation ended and we all settled into the lecture hall’s velvet-cushioned pews, Blume and Nancy Pearl took center stage in over-stuffed chairs. “Your books changed a generation,” Pearl told Blume, as the nationally-known Seattle librarian and author let us eavesdrop on what felt like an intimate conversation between two women who admire equally each other’s work. Soon the discssion turned to Blume’s new novel, her first in ten years, In the Unlikely Event. This one, for adults, is based on actual (unlikely) events—a series of plane crashes that happened in the 1950s in Blume’s hometown of Elizabeth, New Jersey. The novel follows three generations of characters that Blume hopes readers will all come away thinking about. I’ve just started the book, and I’m already drawn in by those character as well as Blume’s vivid descriptions of 1950s America. As delighted as I was to hear Blume and to learn about her writing, my breath was taken away by what preceded her conversation with Pearl. Another Seattle Arts and Lectures program—WITS – Writers in the Schools—sparks interest in reading and writing by placing professional writers in school classrooms and at Seattle Children’s Hospital. WITS encourages students to write about what they know best—themselves—and helps them find their own, authentic voices. At the beginning of each SAL lecture, a student from the program gives a short reading of her/his work. I love immensely. I love often. I love completely, with parts of myself that are scarcely used for anything else. I might love more than I should. I’ve learned love through others; through people who fill me up and break me down all at once. Sometimes, after all this growth I’ve done, I think I must be finished. But no matter how many times I build my heart up, no matter how many times I think I’ve made it, I will always fall apart again. And from the rubble of my heart I will rebuild. I will build something taller, something stronger, something more beautiful. I forget that I’m not a problem that needs solving, or an essay that just needs some edits. There’s no solution, no completion in a person. There’s no period or exclamation point to wrap me up. I look forward to hearing more of Hannah’s voice. Perhaps she is another Judy Blume in the making, another woman whose words and characters will make us think. Which women’s words make you think? Gretchen – what great women’s words! I, too, love Mary Oliver’s “Tell me, what is it you plan to do with your one wild and precious life?” Thanks for this inspiring list.